The “Three Levels of Reality” sounds like a great title for a Star Trek episode. However, it is a model that can improve our ability to communicate effectively, handle conflict in a positive way, and motivate others. I learned the concept during my Organization and Relationship System Coaching (ORSC) certification and I discuss it in leadership seminars all the time. Essence level is feeling and experience before we articulate it. Once we start to describe it, it becomes more concrete and less accurate because the description depends on words which cannot adequately capture an experience, feeling, or potential. Once we have named a feeling or experience, we are in Dream Level. Here’s where creativity lives. We create different possible outcomes and dream up things that we can then make real in Consensus Reality. Consensus Reality is what we all agree is really here – chairs, sky, music, etc. Consensus Reality is what exists in our world. In Myers-Briggs Type Indicator (MBTI) terms, Extroverts have a tendency to dream out loud. Introverts, on the other hand, do their dreaming in their heads. I am an Introvert and my husband is an Extrovert. It took me a long time to realize that he doesn’t always plan to do what he talks about doing. Many times he is just articulating a dream. For example, one day we were standing behind our brick home and he said, “Let’s just take a sledgehammer and knock out that bathroom wall. We can expand the house out here into the yard.” Now there was a day when I would have immediately started arguing: “We don’t have the money for that right now!” or “That would be a hugely messy job and we need an architect to make sure it looks good.” I would have interpreted his dream as a call to action in Consensus Reality Level and responded with practical objections. However, I recognized that he was in Dream Level and I joined him there: “Yes, we could make the bathroom and the closet bigger.” We talked about all the great possibilities that would result from knocking down that brick wall. Recognizing and playing in Dream Level is fun – and it’s important to alert the other person if you’re thinking of grabbing a sledgehammer and moving to Consensus Reality. In meetings it can frustrate a group to chronically stay at Dreaming Level because the group never DOES anything. If they don’t move to Consensus Reality Level, they don’t get actionable solutions. 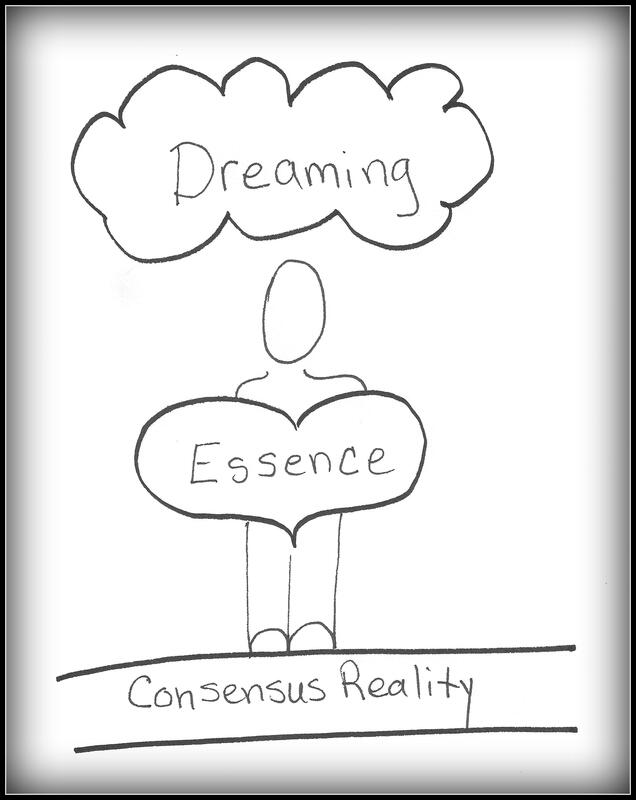 On the other hand, if a group jumps straight to Consensus Reality Level, they miss a lot of possibilities that happen in brainstorming and exploring in Dream Level. A good leader recognizes in which level the group is operating and steers them through the levels as appropriate. Great leaders are people who can motivate others, really light a fire in other people’s souls. When leaders create a vision in a way that compels everyone to jump on board, they are operating in Essence Level. They find ways to touch the hearts of others and activate visceral feelings of hope, desire, belonging, and shared vision. As with all powerful tools, creating feelings at the Essence Level can also be done with selfish intent. One can whip up feelings of hatred, fear and a deep need for self-protection. It behooves each of us to recognize when someone is activating a feeling in our hearts. What is the intent of the person or group that is reaching out to affect us in such a personal and powerful way? Knowing when someone is affecting you at Essence Level is an important first step to becoming an observer and figuring out what is going on. The current day example of a group that intentionally operates in Essence Level for self-promotion is the news channels. They are excellent at activating fear, disapproval and disconnection no matter in which end of the societal spectrum they dwell. Hitler was great at reaching people at Essence Level. So was Martin Luther King. It’s a good idea to take a long look at the person or group who is trying to flick the on/off switch of your emotions. It’s important to check in to be sure that we stay in alignment with our own values and goals. Here’s the bottom line: 1) Understanding and using the Three Levels of Reality is the hallmark of a great leader – and a despot. Powerful tools beget powerful results. As benevolent leaders, we want to use the power wisely for the good of the group. Steering a group into the different levels affects motivation, creativity and productivity. 2) Understanding the Three Levels of Reality is also a powerful shield against those who would use our emotions for their own gain. We create that shield by moving into observer mode and questioning the intent of the speaker and the alignment of her or his message with our values.